The number of elderly Britons dying from the cold jumped 49 per cent last winter following punishing increases in gas and electricity bill. According to the Office for National Statistics, there were 36,700 more deaths last winter than in a comparable number of warmer months. That meant the total of what are known as Excess Winter Deaths for England and Wales was up 12,000 on the previous year and at the highest level in a decade. The grim statistics will add to fears that the high fatality rate will be repeated this winter following a refusal by energy suppliers to cut tariffs before temperatures drop. They also leave the 'big six' companies - British Gas, Scottish and Southern Energy, RWE nPower, Eon, EDF and Scottish Power - open to criticism. All six are enjoying huge profits after failing to pass on a sharp fall in the wholesale cost of gas and electricity to customers. Their bills went up by an average of 42 per cent or £381 last year, putting a strain on the budgets of pensioners and others. Since then, wholesale prices have fallen by more than 50 per cent, however bills have been reduced by only 4 per cent, around £50 a year. Today, official customer watchdog Consumer Focus is calling on the Government to order a Competition Commission inquiry into the failure to pass on lower wholesale costs. It says there is scope to cut energy bills by at least £62 a year immediately, with further reductions possible. Last winter's sharp rise in deaths followed warnings that high bills would leave five million people to choose between heating and eating. Charities argue high bills contributed to the fatality rate. 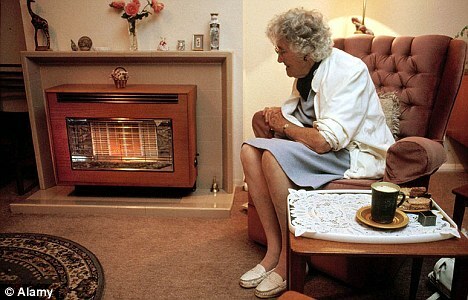 Jenny Saunders, of National Energy Action, said: 'Pensioners are often anxious to avoid debt and turn their heating down or even off, often unaware that they are putting their health in danger. The Excess Winter Deaths total is a record of how many more deaths there are during winter months compared with the non-winter months. These extra deaths, the majority among pensioners, are due mostly to the effects of the cold which aggravates underlying health problems and increases the likelihood of falls. Robert Hammond of Consumer Focus said: 'Millions of people are paying over the odds to heat their homes this winter, despite huge falls in the wholesale price of gas. 0 Responses to "Fuel firms facing criticism as the number of winter deaths reaches highest level in a decade"